Side with Love t-shirts are perfect for displaying love at any public witness. 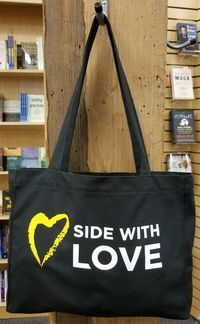 This Side with Love, fair trade apron is perfect for volunteer and congregational use. Side with Love and top off your ensemble with our SWL baseball cap. Embroidered with the SWL heart and “love.” One size fits most with adjustable strap. Beep beep, love on board! 11.5" x 3.75". Pack of 10. Our buttons make excellent prizes, handouts, and giveaways for anyone that marches under the Side with Love banner. 1.75" x 2.75". Pack of 10. Side with Love everyday with our durable, fair trade canvas tote. Our signature yellow Side with Love t-shirts for children. Don't let chilly weather get you down. Our hoodies will keep you warm and keep your love on display. Front pouch with draw strings. Pack of 10. 18 x 12" on 10pt cover stock paper with printing on both sides. Not intended for use as yard signs as they are not waterproof. Proclaim your commitment to justice in warm comfort with these SWL socks.